On-loan striker Conor Sammon is being backed to earn a Republic of Ireland recall thanks to rediscovering his goalscoring touch with Kilmarnock. Sammon struck a late equaliser in Saturday's 1-1 draw with Partick Thistle, his second goal in two games and third since joining from Hearts. And interim Kilmarnock manager Lee McCulloch said: "If he keeps playing and scoring goals, he should be going away on international duty. "He's brilliant to work with." Sammon, who joined Hearts from Derby County last summer, has won nine caps but has not featured for his country since 2013. The 30-year-old failed to shine at Tynecastle, scoring once in 22 games, but he has found the net three times in seven appearances in his second spell at Rugby Park. "He's really enjoying his football again," said McCulloch. "At his previous club, his confidence was shot to pieces, for maybe a number of reasons, I don't know. "But he knows this is sort of his second home. "He's been here before, he's fired goals in here before." 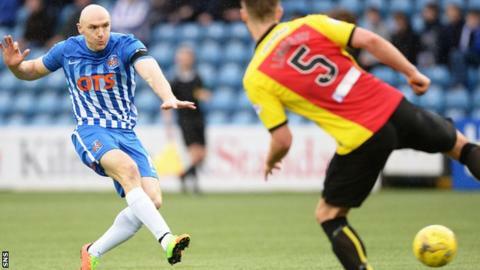 Sammon won a move to Wigan Athletic after impressing in his previous spell with Kilmarnock, scoring 25 goals in 76 appearances. He moved to Derby, but fell out of favour at the Rams and spent time on loan with Ipswich Town, Rotherham United and Sheffield United before joining Hearts. "He's got everything, he scores goals, he's quick, he's strong, powerful, he's got a good strike on him," added McCulloch. "He's keen to keep improving and he's brilliant for the young boys in the dressing-room.